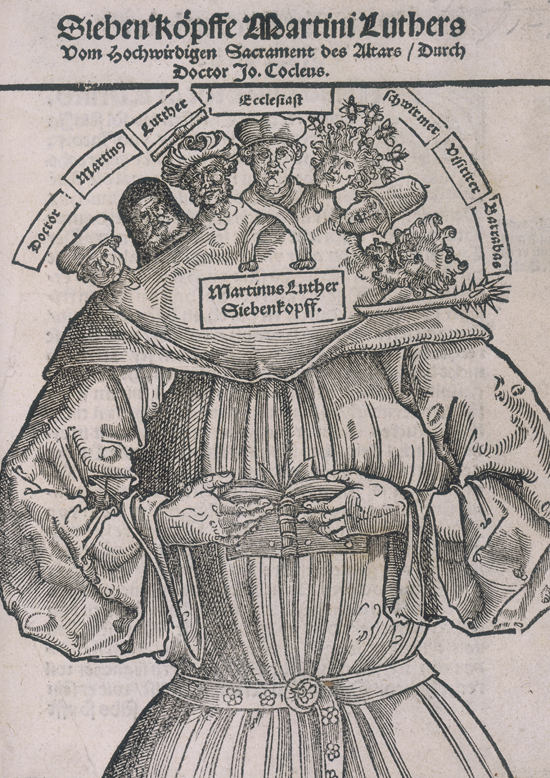 This polemical image appeared on the title page of the pamphlet The Seven Heads of Martin Luther by Johannes Cochlaeus. It shows Luther with seven heads, each of which bears a different title: Doctor, Martinus, Luther, Clergyman, Enthusiast, Visitor, and Barrabbas. It is both a caricature of Luther and a defamation of him as the antichrist (the seven-headed beast of the apocalypse). The woodcut inspired a Protestant counter-image, the “Seven-Headed Papacy ,” Woodcut by Hans Brosamer (c. 1500-52), 1529.